Do you need to buy a shipping container in Scotland? Containers are being delivered to Aberdeen & Grampian, Angus & Dundee, Argyll, Ayrshire, Dumfries & Galloway, Edinburgh & the Lothians, Fife, Glasgow & Clyde Valley, The Scottish Highlands, Orkney, The Outer & Inner Hebrides, Perthshire, The Scottish Borders, The Shetland Islands, and Stirling & The Trossachs on a weekly basis. For further information regarding cost and delivery, please contact us and a member of our team will be in touch. 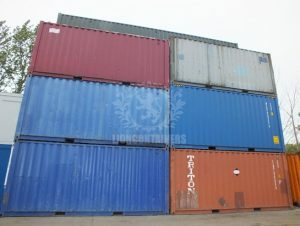 Lion Containers Ltd supply shipping containers for sale, for a a variety of purposes including domestic and business storage, as well as for conversions and accommodation. Our standard new and used container sizes are 10ft, 20ft and 40ft but we can provide anything from 7ft to 42ft. We can source and deliver your container quickly and economically to Aberdeen & Grampian, Angus & Dundee, Argyll, Ayrshire, Dumfries & Galloway, Edinburgh & the Lothians, Fife, Glasgow & Clyde Valley, The Scottish Highlands, Orkney, The Outer & Inner Hebrides, Perthshire, The Scottish Borders, The Shetland Islands, and Stirling & The Trossachs. The savings we make on delivery from dispatching your container from your local depot are passed on to you! We recently completed two major conversion jobs for the Glasgow 2015 Commonwealth Games. View our case studies for the Commonwealth Games’ Broadcast Studio and the Commonwealth Games’ Sponsor Pop Up Shop. We also provided an Aberdeen based company with a new custom built offshore container, built to DNV 2.7-1 standard (LLoyds approved), and a 30ft fuel store and boiler room container to another customer in Aberdeenshire. Great service, extremely helpful and incredibly accommodating!